PHOENIX ‒ As a border state, Arizona plays a dual role in some of President Donald Trump’s policy proposals. It wants the border to be shielded from drug smuggling and undocumented immigration, but still be open for trade with Mexico. Arizona Gov. Doug Ducey, a Republican who endorsed Trump during his campaign, has distanced himself from the president’s stance on the North American Free Trade Agreement, NAFTA. Trump called it “the worst trade deal” ever to be signed and has threatened to end it numerous times. As the future of the trade deal between the U.S., Mexico and Canada remains uncertain on a national level and negotiations don’t seem to be moving forward, Ducey’s administration is still pushing to continue the relationship with Mexico, Arizona’s main international trade partner. 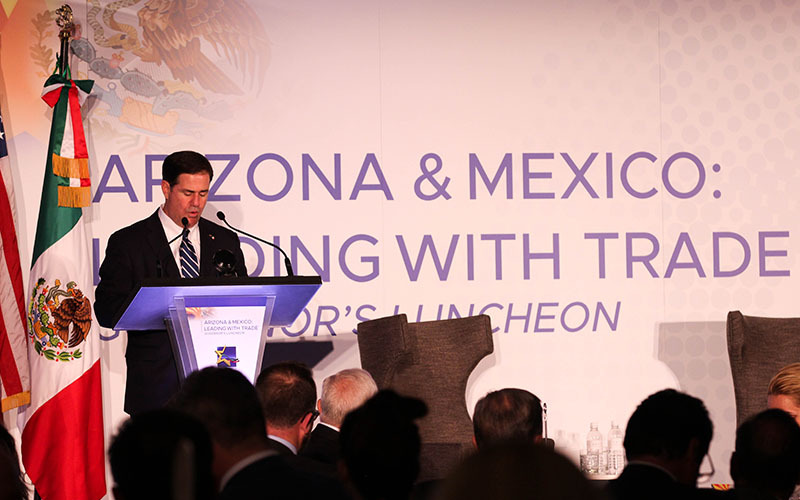 “Arizona doesn’t want to just sit on the sideline and see what happens,” Ducey said during his opening remarks at the Leading with Trade event in Phoenix last week with Mexico’s Ambassador to the U.S., Gerónimo Gutiérrez. “We are advocating for what we want to see as a free and fair-trade relationship with emphasis about how important this relationship and free trade is to the state of Arizona,” he said. 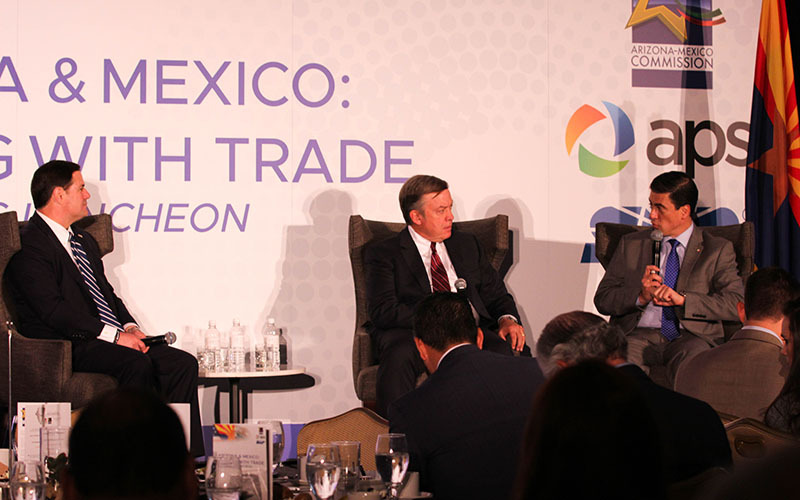 Arizona is the second state in the country with the highest reliance on trade with Mexico, according to a report by the Atlantic Council, representing 37 percent of its total international trade. Just last year, exports to Mexico reached $8.3 billion, most from electric and electronic manufacturing products, while imports accounted for $7.4 billion, mainly agricultural and manufacturing products, census data shows. According to the Arizona-Mexico Commission, that relationship has also created nearly 90,000 jobs in Arizona. Since NAFTA was signed, exports from Arizona to Mexico almost quadrupled, according to the Embassy of Mexico. However, there was a decrease in the first quarter of both 2016 and 2017 for the first time since 2008, according to census data. In September, exports to Mexico went down 19.8 percent compared to last year, according to the Eller College of Management at the University of Arizona. The fifth round of NAFTA talks began Wednesday in Mexico City. After the first meeting, Mexico’s Economy Minister, Ildefonso Guajardo said Mexico could accept the 5-year review of the agreement, as long as it doesn’t mean it will automatically end after that period, according to Bloomberg. That was one of the U.S. proposals that received a negative reaction by Canada and Mexico during the previous round. The second one was increasing the amount of American parts in automotive production. Negotiators are expected to discuss issues such as e-commerce and telecommunications during this round, according to Bloomberg. James E. Garcia, director of communications and public policy at the Arizona Hispanic Chamber of Commerce, said he thought the tense relationship between the two countries during the last year could have had a negative effect in business. Still, Arizona has put a lot of effort into boosting its trade relationship with Mexico, from the bilateral efforts to attract the $700 million electric car plant that will be built in Casa Grande, to the Arizona Department of Transportation’s training program for cargo truck drivers from Mexico. The latest announcement is the cargo processing program at the Phoenix-Mesa Gateway Airport. The program would bring Mexican customs officials to the Mesa airport to inspect goods exported to Mexico and reduce waiting times at customs, according to an Arizona Republic report. Mesa officials said the program would attract online retailers like Amazon or eBay, a market that last year produced around $17.63 billion in Mexico, according to a report by the Mexican Internet Association. According to the same report, two out of three Mexican online buyers shopped from international retailers in 2016, and the number one market was the U.S. The main reasons were better prices and products that were not available in Mexico. Martha Ramirez is an accountant who lives in Mexico City, where the majority of online shoppers live. She was looking for a 30-dollar branded face cream, a common product for middle-class Mexicans, in every shop in the city, but couldn’t find it. She finally found it on Amazon and had it delivered to her home with no shipping cost 12 days after. “I couldn’t find that cream in Mexico, and there are many other products I want that are not available here,” Ramirez said. Ramirez also has a reading group for young kids and she likes to use books in foreign languages, which she says she can only find in the U.S.
She said she will continue to buy from Amazon even if the shipping cost increases. Ambassador Gutiérrez and other Mexican officials have recognized the 23-year-old agreement needs to be updated to consider new business transactions such as e-commerce, but the three countries could not come to an agreement after the U.S. suggested it wanted to raise the current dollar limit of products that can be exported with no tariffs. Garcia said the business community in Arizona is feeling “nervous.” But he also said cancelling NAFTA would bring more than economic challenges and job loss to the state. According to the Spain’s Bank Santander, without NAFTA, the Mexican economy would shrink substantially. While negotiators resume their conversations about NAFTA facing a field of roadblocks, Ambassador Gutiérrez said it’s important to speak up.